JOHNSTOWN — Residents of the Fulton Center for Rehabilitation and Healthcare — at least for one day this week — were transported in time to a whimsical period between the European Middle Ages and modern history. Dressed in outfits from those centuries, both residents and staff on Wednesday participated in the facility’s first-ever Renaissance Fair. 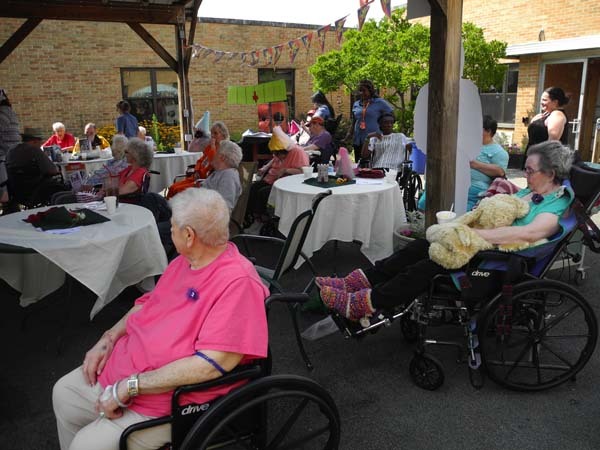 Staff at the private center made the event happen for many bright-eyed senior residents, who had drawings made of themselves, were served treats and enjoyed a day under the summer sun on the facility’s courtyard and grounds. 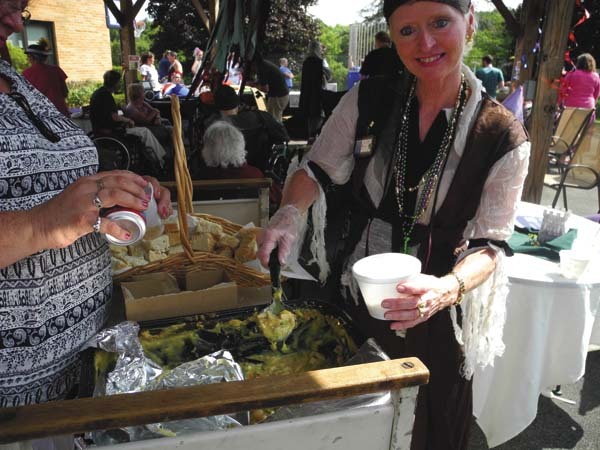 Activities offered to residents during the Renaissance Fair included tarot card readings, a herbalist with oils, sketch artist, harpist, mini-catapults for residents to fling, seamstress, wreath toss, photo booth, art show and a live horse show. 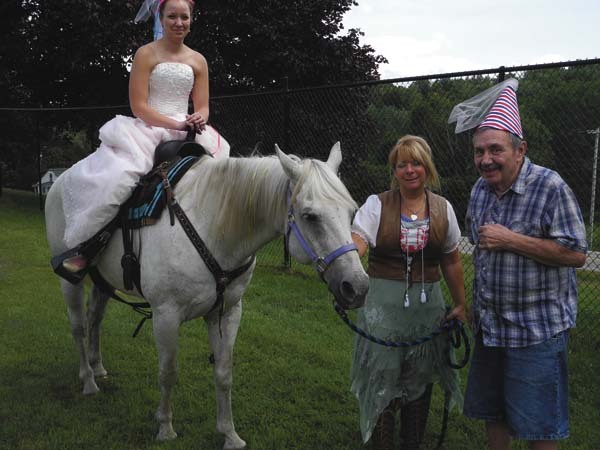 Unit Manager Alicia Opalka subjected herself to a dunk booth, and nurse Rene Mosher brought in her horse for residents to enjoy. 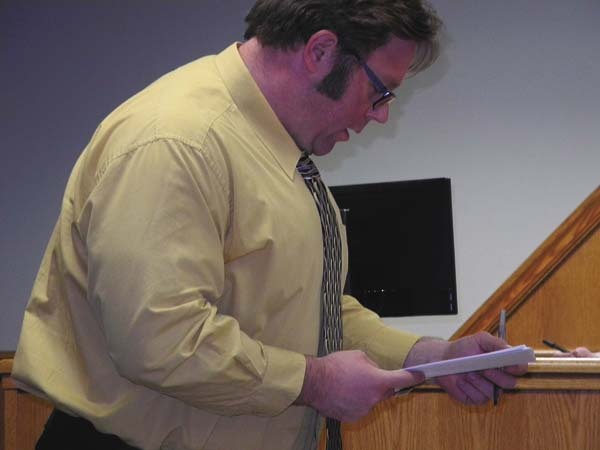 Murphy explained that the Fulton Center for Rehabilitation and Healthcare — during the course of the year — has many activities for its residents to get them out for some fun. Past events have included a “Caribbean Cruise” at the center, she said. “It gets everybody together,” noticed resident Jane McCarthy of Johnstown. She was seated next to artist Carol Jordan, who was drawing a colorful caricature of resident Virginia Thompson. Resident Wayne Gottobed said he loved the event’s atmosphere. The Leader-Herald/Michael Anich Artist Carol Jordan (not seen) compares her drawing of Fulton Center for Rehabilitation and Healthcare resident Virginia Thompson to the real thing at the nursing home's Renaissance Fair Wednesday in the town of Johnstown. Center Administrator Leonard Hersh was all smiles as he surveyed what was happening at the fair. He said these types of activities — for residents being uprooted for rehabilitation at facilities like his — is exactly what the doctor ordered. “When people aren’t home and not feeling quite as good as they feel, it helps to uplift them,” Hersh said. 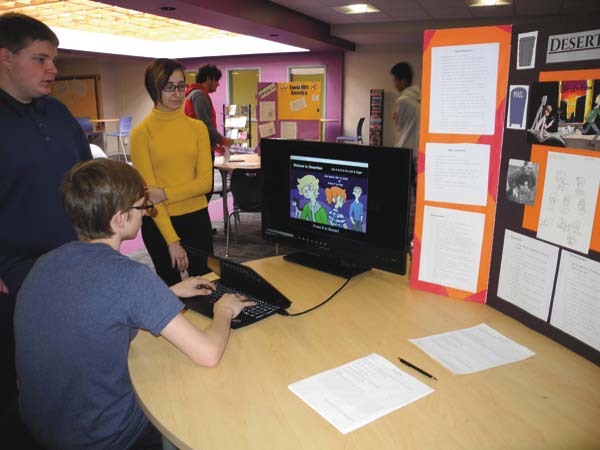 He praised the activities department for planning and carrying out events such as the Renaissance Fair. He also noted his facility receives “a lot of corporate support.” The facility is run by Bronx-based parent company Centers Health Care. Centers Health Care provides health care resources for the post-acute health care continuum in New York, New Jersey and Rhode Island. 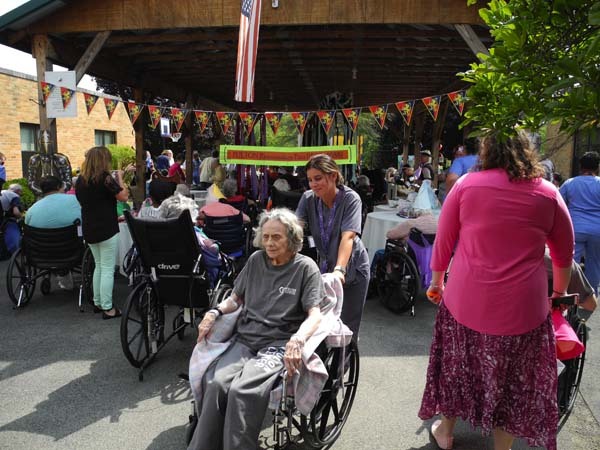 Every facility involves rehabilitation and therapy, as well as nursing home care and offer adult day care and assisted living. The Leader-Herald/Michael Anich Harps for Healing artist Donna Adams-Profeta performs during the Fulton Center for Rehabilitation and Healthcare's Renaissance Fair Wednesday at the town of Johnstown facility. 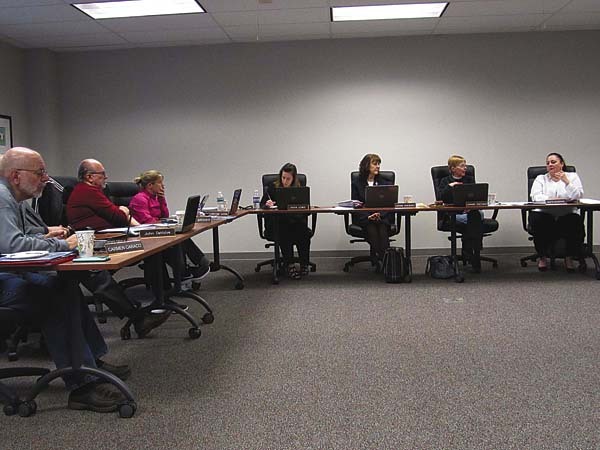 Locally, Fulton Center for Rehabilitation and Healthcare, a 175-bed skilled nursing facility, is located on County Highway 122 in the town of Johnstown. Residents can request to live in a single room or share a room with another resident. Center residents have a wide range of medical support services available to them, in addition to the physical, occupational and speech therapy, on-site physician and dental services provided. 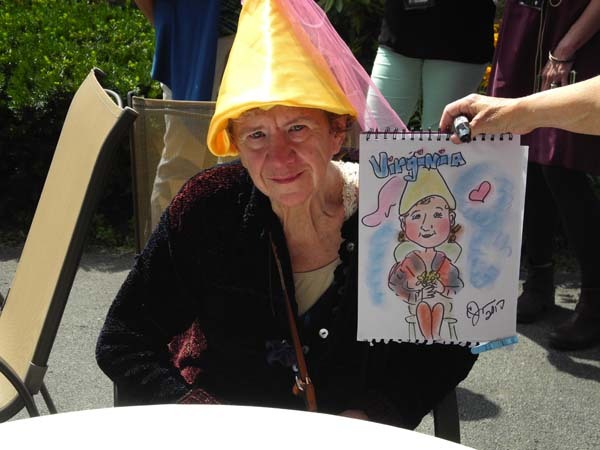 The Leader-Herald/Michael Anich Artist Carol Jordan (not seen) compares her drawing of Fulton Center for Rehabilitation and Healthcare resident Virginia Thompson to the real thing at the nursing home’s Renaissance Fair Wednesday in the town of Johnstown. The Leader-Herald/Michael Anich The entrance to the Fulton Center for Rehabilitation and Healthcare’s Renaissance Fair is seen Wednesday. 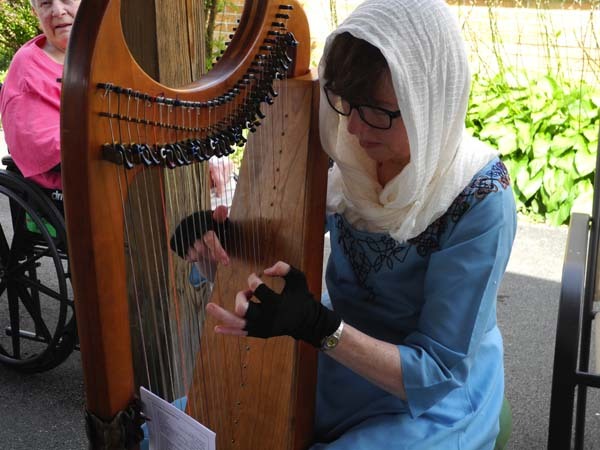 The Leader-Herald/Michael Anich Harps for Healing artist Donna Adams-Profeta performs during the Fulton Center for Rehabilitation and Healthcare’s Renaissance Fair Wednesday at the town of Johnstown facility. The Leader-Herald/Michael Anich Participants relax at the Fulton Center for Rehabilitation and Healthcare’s Renaissance Fair Wednesday in the town of Johnstown. The Leader-Herald/Michael Anich The entrance to the Fulton Center for Rehabilitation and Healthcare's Renaissance Fair is seen Wednesday. The Leader-Herald/Michael Anich Participants relax at the Fulton Center for Rehabilitation and Healthcare's Renaissance Fair Wednesday in the town of Johnstown.